The stage is waiting for YOU! We know that our community has a lot of talented people! We can't wait to see what you can do. So we are providing the stage and you provide the talent. Whether you are 6 or 106, the Tomah Rotary Club is hosting this special event and lis looking forward to seeing you perform! Please note the rules below for more information. See you there! and you can purchase tickets from our EventBrite site by CLICKING HERE. 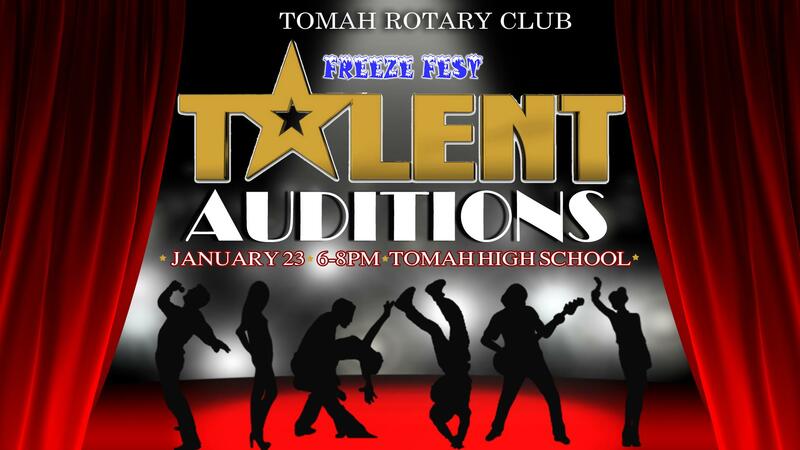 Please Note: All Talent Show Applications must be received by Deb Reid, THS, no later than Friday Jan 18th at 5 PM by emailing or drop off debrareid@tomah.education. For questions call: (608) 344-0947. Be on time for the audition. Have equipment, props, and music ready. 1. Each individual contestant may only compete in their own age division. For groups, use oldest member for group division. Show is open to Age 6 and above. 2. A person may be in up to two acts. Only one act will be judged. 3. A person may perform and not be judged. ALL performers/acts must audition., even if not being judged. 4. The show is open to amateurs only. 6. Up to fifteen (15) finalists will be selected to perform at the live show, at judge’s discretion. 7. Communication will be via text, phone or email. 8. Each contestant will be allowed no more than 5 minutes total on stage. 9. All acts using music will be allowed only one song or tune, up to 5 minutes total, allow set-up. 9. A CD player will be provided and all recorded music used must be on a CD. A sound system with up to 2 handheld microphones will be provided. A Piano will be available upon request. Contestant must provide any accompanist and any music. 10. Contestants must perform the same act (same song/dance) in the final show, as in the audition. 11. Contestants will not be allowed to perform if not properly clothed or any foul language is used. 13. All selected contestants must be present for technical “run-through” of Live Show, beginning at 11:30 AM on the day of the show, Feb 10th. 14. Prize will be given for Crowd Favorite for those acts that are judged.